This is a rather silly pose. If you look closely, you can see my earrings are French flags! Get it? 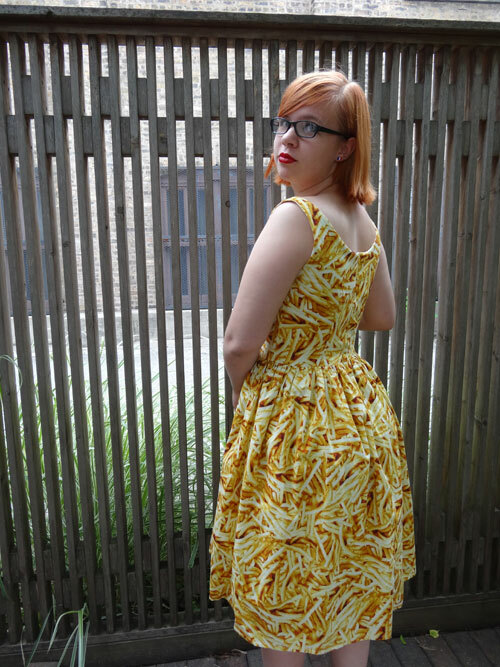 The pattern I used for this dress is the Seersuker Sundress from Gertie’s New Book for Better Sewing and I used two yards of French Fry fabric. Since both the book and the fabric were Christmas gifts, I found myself with two yards of fabric and a pattern that called for three. 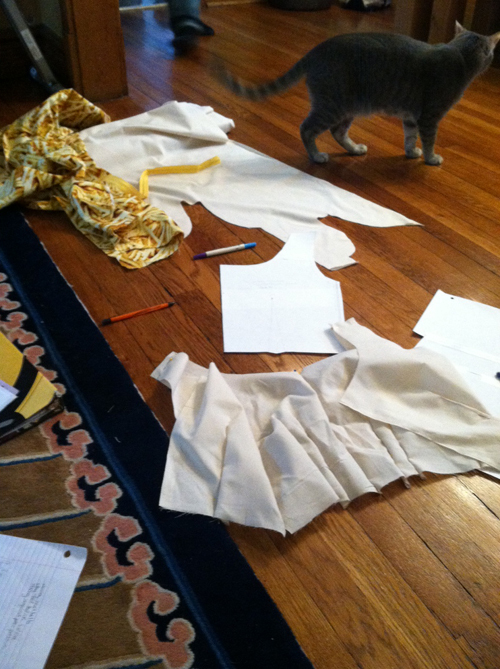 Luckily, when I went to lay out my pattern pieces, there was easily enough space for all of them. “In Progress” featuring a helpful cat. Pictured above is the muslin I made for the dress. I only made one muslin, and I only needed to adjust the front and back by taking them in by about 5/8 of an inch. I fully lined the dress with the muslin. Hand sewing may take a long time, but it’s worth it! I put in an invisible zipper instead of a lapped zipper, and this is the best invisible zipper I have ever done. The secret is to hand sew the whole zipper. I also took my time on the gathered skirt in order to make sure the gathers were perfectly even. Instead of gathering by sewing over a thread and pulling it, I pinned every gather out individually. In fact, this garment is probably the best I have ever made. My only regret is that I didn’t take more time with the four darts in the front of the bodice – I could have adjusted them to fit better. 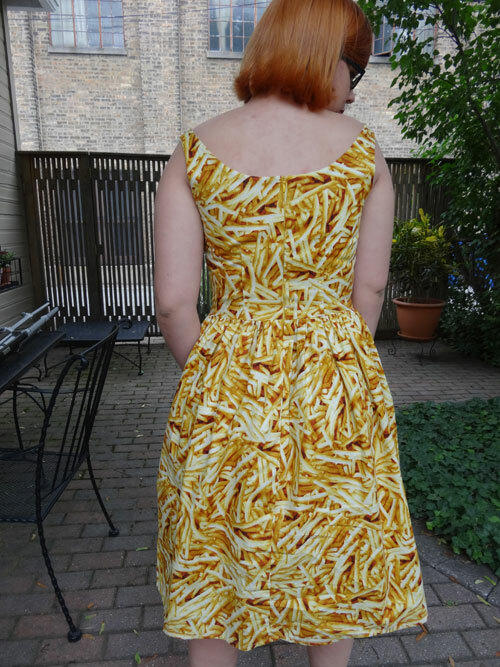 Despite this, the French Fry Dress has been worn a few times already, (It was too cold to wear when I made it) and will definitely be worn over and over again in the future. 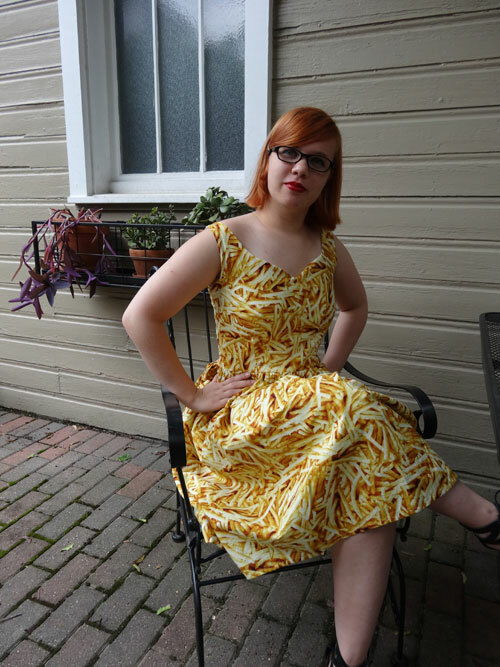 This entry was posted in Personal Garments and tagged Dress, food, yellow by Evelyn. Bookmark the permalink.